The Pacific Northwest might get short shrift for all the rain that falls in winter, but there truly are few places with such beautiful summers — and in green, lush environments, to boot. That’s why we LOVE September in the San Juans. September is prime vacation time. The kids are back in school and the peak crowds have returned home, but the weather is as gorgeous as ever. Historical averages in the San Juans are in the low 70s and high 60s throughout the month — warmer than June and just about the same as July. And with the late-summer breezes cruising through the passages and around the many islands… It’s magical. There’s a lot to do in the San Juan Islands during September: Stop by the farmers’ markets on Orcas and San Juan islands; take a lovely, hilly hike through Cypress Island’s miles of trails; visit the San Juan Islands Sculpture Park and learn all about the 19th-century Pig War. And if you get a little warm from sunbathing on the Diminuendo’s spacious decks, simply slip into the water for a refreshing swim in the sparkling blue-green waters of the PNW. One recent group of guests enjoyed stargazing on the open seas; with no electric lights around, the view of the sky can be truly incredible. 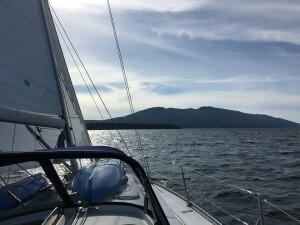 Book Diminuendo — a charming 2001 Jeanneau Sun Odyssey 43DS — for a multi-day cruise through the islands and set your own itinerary, or trust Captain Ron and the mercurial winds of the Salish Sea to guide you. All you have to do is kick back, enjoy home-cooked meals (that’s right; meals are provided on-board!) and let your worries drift away. Trips can be anywhere from 6 hours (perfect for business meetings or afternoon visit with friends) to 6 days. The longer the trip, the less you’ll pay per person per night. Click here for current rates. To secure an all-inclusive sailing adventure in September, it’s recommended to book at least two months in advance. Contact Northwest Sailing Adventures today for the perfect September vacation. 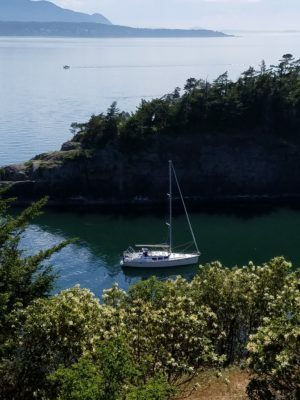 Captain Ron and First Mate Mari are committed to ensuring that every single person who books with Northwest Sailing has a vacation to remember.